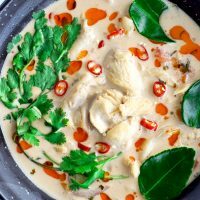 This Tom Kha Gai (Coconut Milk Chicken Soup) is an intensely aromatic and flavorful traditional Thai soup. It is fragrantly sweet and a little spicy, and ultimately just a tasty bowl full of chicken and mushroom soup heaven! It’s also naturally gluten-free and dairy-free. Prepare all your fresh ingredients: Chop the garlic, red chilies, ginger, galangal, lemongrass, red onion, tomato, coriander, and kaffir lime leaves. Place in small bowls and set aside. Rinse and dry the oyster mushrooms and chop them into smaller pieces if needed. Chicken: Slice your chicken breasts thinly into bite sized pieces. Limes: Squeeze the limes in a lemon/citrus squeezer and reserve the juice in a small bowl or bottle. Heat olive oil and chili oil in a large stockpot or Dutch oven over medium high heat. Once hot, add the red onion and sauté for 1-2 minutes or until translucent. Add the garlic and red chilies and continue to sauté for 1 minute until fragrant. Next, pour in half (200ml) of the coconut milk, and add the galangal, ginger, lemongrass, and stir. Then add the tomato wedges, stir to combine and bring to a slow simmer for 2-3 minutes. Add the rest of the coconut milk (200ml), the chicken slices, oyster mushrooms, and 200ml water. Stir and cook until the chicken is no longer pink – about 1 minute. Add the Thai dried chilies, coconut sugar, and kaffir lime leaves and stir. Season with fish sauce, kosher salt, ground Thai red chili pepper to taste, and pour in the lime juice. Give everything a good stir, then cover the pot and let simmer for 10-12 minutes. Uncover the pot and stir the soup. Taste and adjust the kosher salt, sugar, fish sauce, and ground Thai red chili pepper if needed and as required. Stir in ¾ of the chopped coriander and switch off the heat. Garnish/To serve: Ladle the soup into bowls, garnish with the remainder coriander, and drizzle a bit of chili oil over the top for some extra OOMPH!! Serve with steamed white rice and lime wedges if desired. While you can simmer the soup with the aromatics first, then strain the soup and discard them before adding the chicken and mushrooms, I prefer not to because leaving them in allows the soup to build more flavor. Your call here, but I don’t recommend this method because you can easily pick them out while eating or leave them at the bottom of the bowl.